Decoration 17 large historiated initials (ff. 1, 5v, 6, 8, 24, 34v, 49, 52, 65v, 88), or miniatures (ff. 1v, 2, 3, 58v, 64v) in colours and gold with marginal extensions forming partial bar borders, in the Lumiere as lais. 68 large miniatures in colours and gold (ff. 106, 107, 108v, 109v, 117v, 122, 122v, 124, 126, 127-128, 129, 130, 131, 132, 133v, 134v, 135v, 136v, 137v, 138, 139, 139v, 141, 142, 143, 144, 145v, 146v, 147v, 149, 151, 152, 153, 154v, 156, 157v, 158, 160, 162v, 164, , 165, 166v, 167v, 169, 170v, 172, 174v, 176, 177v, 179v, 183, 184, 187v, 188v, 191, 192v, 193, 194, 194v, 197v, 198v, 199, 202v, 208, 212v, 213v) and historiated initials (ff. 104, 155), with marginal extensions forming partial borders, in the Apocalypse. 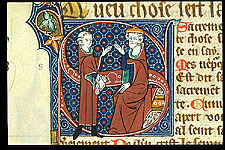 Small historiated initials containing human heads or foliate initials, some containing hybrids, in colours and gold with marginal extensions. Initials in gold on blue and rose grounds with penwork decoration in white. Cadels. Binding Post-1600. Royal Library brown-leather binding with the royal arms of England and gilded and gauffered edges, 1757. Provenance Lionel de Welles, 6th Baron Welles, (b. 1406, d. 29 March 1461), by 1430: his inventory with an 'Item I liber vocatus apocalipiz gallice scriptus' and 'Item I lucidarium in french' (see M. Hamel, 1990 and Sandler 2012 p. 92). John, viscount Welles (d. 1499), soldier and administrator, and his wife, Cecilia Welles (d. 1507), daughter of Edward IV, king of England: a list of woods sales mentioning John's property in Well (now Welle Park, Lincolnshire) and other places in the proximity of his properties in Well and Belleau, including a reference to a personal property 'a nacur in my nawn manour in modurwode [Motherwood, near Alferd]', (f. 215v) (see Egbert 1936, pp. 446-48); and a list of books in English, written probably in the same hand, including the present manuscript: inscribed, 'In primus a boke in France clakld pokelypse / A boke of knghte hode / A boke of Caunturbere tlase / A boke of Charlman / A boke þe lyfe of our ladys lyfe / A boke the sheys of Thebes / A boke cald vita mixta / A boke cald þe vii poyntes of true love / A boke cald þe sheys of Jherusalem / A boke cald mort Arthro / A boke cald dyuys et paupar / A boke cald cronackols / A boke cald legend aure / A boke cald facekelus temporum [perhaps a text by the Carthusian Rolevink, printed in 1475]', end of the 15th century (f. 211); inscribed 'Ciecyl Welles' (under erasure), (f. 1). Henry VIII (b. 1491, d. 1547), king of England and Ireland (the brother-in-law of Cecily Welles): the monogram 'HR' [for Henricus Rex] (f. 1). The Old Royal Library (the English Royal Library): Westminster inventory number 'no. 468' (f. 1), included in the inventory of books in the Upper Library at Westminster of 1542’, and in the catalogue of 1666, Royal Appendix 71, f. 13. Includes La lumiere as lais of Peter of Peckham (or Peter of Fetcham) in Anglo-French (ff. 1-103v), and the Apocalypse with a commentary in the Anglo-French prose version (ff. 104-214v). According to Sandler, stylistically related to the Grey-Fitzpayn Hours, Cambridge, Fitzwilliam Museum 242. See also Egbert 1940. One of two of the eleven complete surviving copies of the Lumere that includes an epilogue: Que ceste livre escrit e escrivera, De tuz mauz li fende Deu ke purra. Dieu omnipotent tut pussaunt, Ore doin a li sa grace e pus avaunt Touz iceuz ke lisent e bien entent. De tuz lur pecchez face il amendement. (May God protect from all evils he who writes and will write this book. Now may all-powerful God almighty give him his grace and power. May He grant remission of all their sins to those who read it and understand it well.) See Sandler (2012) p. 79 citing Hesketh p. 25. Select bibliography Walter de Gray Birch and Henry Jenner, Early Drawings and Illuminations: An Introduction to the Study of Illustrated Manuscripts (London: Bagster and Sons, 1879), p. 8. W. R. Tymms and M. D. Wyatt, The Art of Illuminating as Practised in Europe from the Earliest Times (London: Day and Sons, 1860; repr. Studio Editions, 1987), pl. XIV.8. Samuel Berger, La bible française au moyen âge (Paris: Champion, 1884), pp. 87, 386-87. P. Meyer, 'Les manuscrits français de Cambridge', Romania, 8 (1879), 325-32 (p. 325). L. Delisle and P. Meyer, L'Apocalypse en français au XIIIe siècle (Bibl. Nat. Fr. 403) (Paris: Firmin Didot, 1901), no. 24. Montague Rhodes James, The Trinity Apocalypse (Roxburghe Club, 1909), pp. 9, 26. J. A. Herbert, Illuminated Manuscripts (London: Methuen, 1911), p. 217. Schools of Illumination: Reproductions from Manuscripts in the British Museum, 6 vols (London: British Museum, 1914-1930), III: English A.D. 1300 to 1350 (1921), pl. 9. George F. Warner and Julius P. Gilson, Catalogue of Western Manuscripts in the Old Royal and King’s Collections, 4 vols (London: British Museum, 1921), II, pp. 171-72. [J. A. Herbert], Illuminated Manuscripts and Bindings of Manuscripts Exhibited in The Grenville Library: Guide to the Exhibited Manuscripts, 3 (Oxford: British Museum, 1923), no 108. [J. A. Herbert], British Museum: Reproductions from Illuminated Manuscripts, Series 2, 3rd edn (London: British Museum, 1923), pl. 13. Eric. G. Millar, English Illuminated Manuscripts of the XIVth and XVth Century (Paris: Van Oest, 1928), pp. 19, 82. Elfrida O. Saunders, English Illumination, 2 vols (Paris: Pegasus Press, 1928, repr. New York, 1969), I, pp. 84, 90, 91. Montague Rhodes James, The Apocalypse in Art, The Schweich Lectures of the British Academy, 1927 (London: British Academy, 1931), no. 24. Guide to an Exhibition of English Art gathered from Various Departments and held in the Prints and Drawings Gallery (London: British Museum, 1934), no. 126. Donald Drew Egbert, A Sister to the Tickhill Psalter: The Psalter of Queen Isabella of England, an English Gothic Manuscript of the Early Fourteenth Century now in the Bayerische Staatsbibliothek at Munich, cod. gall. 16 (New York: New York Public Library, 1935), p. 6. Donald Drew Egbert, 'The So-called 'Greenfield' La lumiere as lais and Apocalypse, British Museum, Royal MS. 15 d II', Speculum: A Journal of Medieval Studies, 11 (1936) 446-52 (pp. 446 passim). Donald Drew Egbert, The Tickhill Psalter and Related Manuscripts: A School of Manuscript Illumination in England during the Early Fourteenth Century (New York: New York Public Library, 1940), pp. 95-100, 182-88. R. Freyhan, 'Joachism and the English Apocalypse', Journal of the Warburg and Courtauld Institutes, 18 (1955), pp. 211-44 (p. 288, n. 2). Peter Brieger, English Art 1216-1307, Oxford History of English Art, 4 (Oxford: The Clarendon Press, 1957), p. 217. M. Dominica Legge, Anglo-Norman Literature and its Background (Oxford: Clarendon Press, 1963), pp. 214-16, 237. Medieval Libraries of Great Britain: A List of Surviving Books, ed. by N. R. Ker, 2nd edn, Royal Historical Society Guides and Handbooks, 3 (London: Royal Historical Society, 1964), p. 367 [Greenfield rejected]. Margaret Rickert, Painting in Britain: the Middle Ages, 2nd edn (London: Penguin Books, 1965), p. 162, n. 28. R. M. Wilson, The Lost Literature of Medieval England (London: Methuen, 1970), p. 148. Richard Kenneth Emmerson and Suzanne Lewis, 'Census and Bibliography of Medieval Manuscripts containing Apocalypse Illustrations, ca. 800-1500 II', Traditio: Studies in Ancient and Medieval History, Thought and Religion, 41 (1985), 367-409, no. 74. Lucy Sandler, Freeman, Gothic Manuscripts 1285-1385 (Survey of Manuscripts Illuminated in the British Isles), (Harvey Miller: London, 1986), no. 34. Nigel Morgan, Early Gothic Manuscripts, 2 vols, A Survey of Manuscripts Illuminated in the British Isles, 4 (London Harvey Miller, 1982-1988), II: 1250-1285, pp. 40 nn. 75, 74, 176. Mary Hamel, 'Arthurian Romance in Fifteenth-Century Lindsey: The Books of the Lords Welles', Modern Language Quarterly, 51 (1990) 341-61 (pp. 341, 346-47, 350, 352, n. 44). Nigel Morgan, 'Textes of Devotion and Religious Instruction Associated with Margaret of York', in Margaret of York, Simon Marmion, and the Visions of Tondal, ed. by Thomas Kren (Malibu: J. Paul Getty Museum, 1992), pp. 63-76 (p. 73, n. 40). Suzanne Lewis, Reading Images: Narrative Discourse and Reception in the Thirteenth-Century Illuminated Apocalypse (Cambridge: Cambridge University Press, 1995), p. 379, n. 40. J. P. Carley, 'Marks in Books and the Libraries of Henry VIII', Papers-Bibliographical Society of America, 91 (1997), 583-606 (p. 603). The Libraries of King Henry VIII, ed. by J. P. Carley, Corpus of British Medieval Library Catalogues, 7 (London: The British Library in association with The British Academy, 2000), H2.291. Nigel Morgan, 'French Interpretations of English Apocalpyses', in England and the Continent in the Middle Ages: Studies in Memory of Andrew Martindale, Proceedings of the 1996 Harlaxton Symposium, ed. by John Mitchell and Matthew Moran, Harlaxton Medieval Studies, 8 (Stamford: Shaun Tyas, 2000), pp. 137-56 (p. 144 n. 24). Ian Short, 'Introduction, The Texts', in The Trinity Apocalypse (Trinity College Cambridge, MS R.16.2) (London: British Library, 2005), pp. 123-36 (p. 135). The Splendor of the Word: Medieval and Renaissance Illuminated Manuscripts at the New York Public Library, ed. by Jonathan J. G. Alexander, James H. Marrow, and Lucy Freeman Sandler (London: Harvey Miller, 2005), p. 207 n. 7 [exhibition catalogue]. Nancy L. Ross, 'Forgotten Revelation: The Iconic Development of the Anglo-Norman Verse and Early Prose Apocalypse Manuscripts' (unpublished doctoral thesis, University of Cambridge, 2006), pp. 16, passim. Kathleen L. Scott, Tradition and Innovation in Later Medieval English Manuscripts (London: British Library, 2007), p. 159, n. 173. Aden Kumler, Translating Truth: Ambitious Images and Religious Knowledge in Late Medieval France and England (New Haven: Yale University Press, 2011), pp. 96-100, figs. (24-26). Scot McKendrick, John Lowden, Kathleen Doyle, and al., Royal Manuscripts: The Genius of Illumination (London: British Library, 2011), no. 87 [exhibition catalogue]. Lucy Freeman Sandler, ‘The Lumere as lais and its Readers: Pictorial Evidence from British Library Ms Royal 15 D ii’, in Thresholds of Medieval Visual Culture: Liminal Spaces, ed. by Elina Gertsman and Jill Stevenson (Woodbridge: Boydell, 2012), pp. 73-94. Renana Bartal, Gender, piety, and production in fourteenth-century English Apocalypse manuscripts (London: Routledge, Taylor & Francis Group, 2016), p. 172.